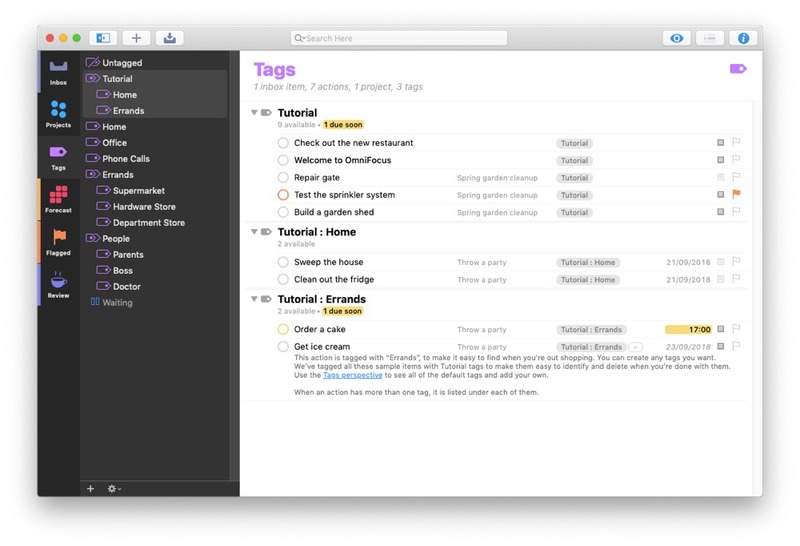 OmniFocus 3 for Mac has landed with a new look, tags, highly configurable perspectives, and a brand new Forecast setup. Here’s a quick overview to bring you up to speed on the most important changes. OmniFocus 3 for Mac looks like a 2018 application. It now has light and dark themes, as OmniGroup have decided to focus on utilizing the system controls available from Mojave onwards to theme the application. The default look is a dark sidebar on the left, and a light background for the tasks area. There’s also a dark mode which is great for working at night. Ken Case, CEO of OmniGroup, has already said that in 3.1 there will be an option with a light sidebar too, so don’t worry if you’re a fan of the fully light mode. The default view is now custom columns rather than the fluid view, but both are available everywhere in OmniFocus. 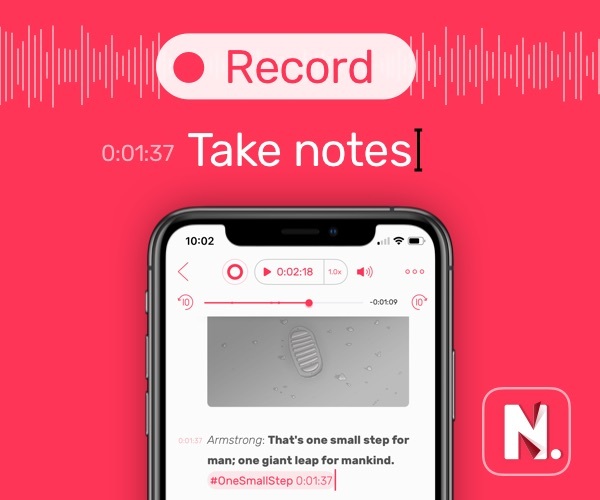 The fluid view looks more iOS like, whereas the custom columns allows you to easily scan down a list of tasks looking for a specific name or tag. 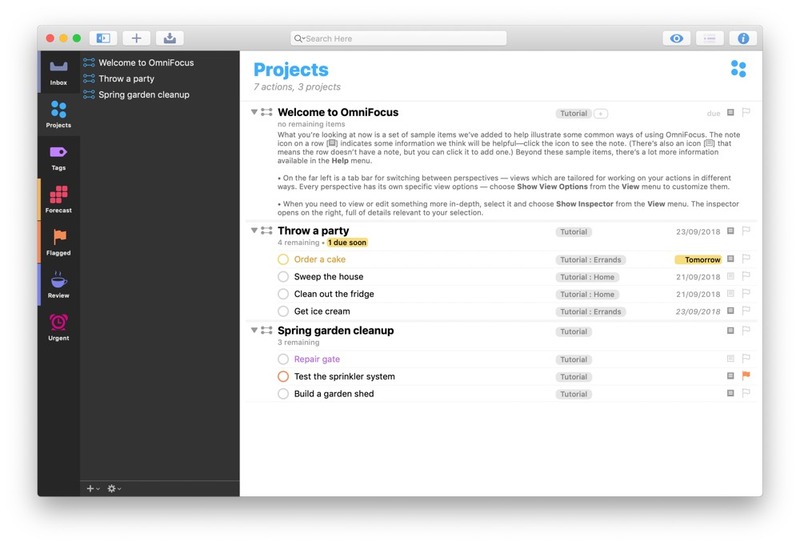 Perspectives have received a massive upgrade in OmniFocus 3. You can now use Boolean logic to create perspective rules — a combination of and, or, and not terms — and you can nest those too. This offers us previously unavailable choices, and in combination with the multiple tags can be extremely useful. You can now filter your tasks for anything not at home or work, but involving chocolate, looking for available tasks that don’t have a due date in the distant future! The Forecast view looks very different in version 3. Your calendar events and tasks are shown together in one view, ordered by date and time. You can now see at a glance how busy your day is — both by tasks and appointments. You can turn off and on individual calendars in the Forecast settings, so if you also have other calendars available on your device, you don’t have to see those in your day. The Forecast tag is also very powerful. In the Forecast settings, you can specify a tag that should be shown under today’s events. Many people have been using a “Today” tag for this, but as you can choose which task to display on each device, you could also have a “Work focus” tag for your work Mac, for example. Repeating tasks also gained a lot of options in this upgrade. As well as the traditional every X days/weeks/months/years for repeats, you can also specify the 2nd and 18th of the month, or the 3rd Thursday in the month. This is ideal for many tasks, including things like submitting a timesheet which often has to be done on the first Monday of the month. OmniFocus 3 for Mac has also added support for the Touch Bar, with options available to clean up, new (inbox) task, new project or tag, and review. 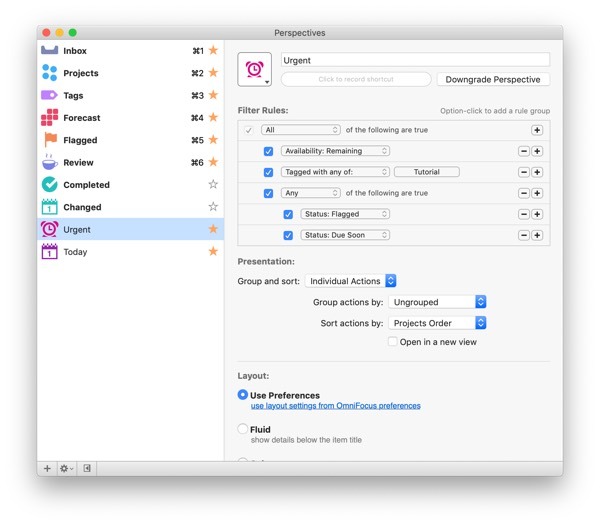 OmniFocus 3 is certainly an exciting iteration in this beloved and powerful application. 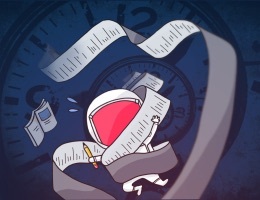 While we love OmniFocus 3 and its focus on power and granularity, we still think Things is the best personal GTD and productivity app suite available today. We’ve produced an incredibly useful course on getting the most out of Things, but it also applies to any GTD tool on the market today.